As the three-year experiment on plus-minus grading nears its end, the Committee on the Undergraduate Program has developed a web-based survey to be administered to undergraduates, graduate students, and faculty. The survey asks students to rate their attitudes towards three different grading systems. One is the current system, with plus and minus modifiers of letter grades shown on internal grade reports but not on the official transcripts sent to graduate schools and not used to calculate overall grade point averages. The second option would result in the modifiers being added to external transcripts and grade point averages. The third option is the system which was in place until fall 1995, with no modifiers on either internal or external transcripts. There are advantages to each grading system, said Professor of Aeronautics and Astronautics Paul A.Lagace '78, chair of the Subcommittee on Intermediate Grades. The survey will be available at http://feedback.mit.edu until Dec. 12, and a discussion site on the topic will exist through the spring term. Additional comments can be e-mailed to survey@mit.edu. "We don't just want to find out what students favor,"Lipson said. "We also want to understand the reasons behind their preferences." The feedback forum, a web-based communications tool designed by Jakob J. Seid G and Andrew Tian G, is the medium being used for the survey. Through the feedback forum, students and faculty can provide and receive anonymous feedback. "The more responses we get, the better we can ascertain what's best for the community,"Lagace said. "There were a couple of things which pushed" the experiment's introduction three years ago, Lagace said. Many faculty members felt that there were not enough grade divisions to accurately reflect student performance. 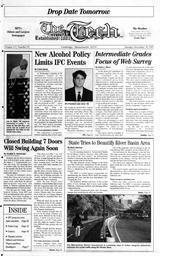 In the fall of 1993, the Committee on Academic Performance first began discussing a change in the grading system. After surveying the student body and bringing the issue before the faculty, they announced that plus and minus grades would be added to internal transcripts as part of a three-year experiment. At a February 1995 faculty meeting, a strong majority of those present voted for the change. "A lot of students who just missed the grade division felt that they had been hard done by" when they received the same grade as if they had been on the lower end of the scale, Lagace said. Student opinion was much less uniform, however, than faculty opinion.Of the 15 percent of students who responded, almost half were against any change to the grading system. "We did quite a bit of pilot testing before [the change in the grading system]� the majority of students were not in favor of having plus-minus grading externally,"said Alberta G. Lipson, associate dean for educational research and one of the major contributors to the survey's development. At the same time, Lipson notes, the registrar's office has found that, among a randomly selected group of students, the addition of modifiers to grade point averages caused little difference. "Students are worried about the minuses, but the pluses are there too,"she says. "They tend to average out." The system currently in effect ostensibly provides students and advisers with more feedback than straight letter grades without the stress that would accompany external modifiers. The question remains, however, whether enough precision exists in the grading system to justify discriminating between, for example, an A and an A-. This is the view put forward by proponents of the pre-1995 system. The CUPhopes to put the issue before the faculty by the summer semester of 1998, in time to implement a permanent system beginning next fall. But "we need a little extra time� we may need to extend the experiment until next fall,"Lagace said.